By C. Eugene Emery Jr. on Thursday, October 25th, 2018 at 9:46 a.m. The push to get people vaccinated against influenza is in full swing, and so are efforts to scare people away from getting their shots. 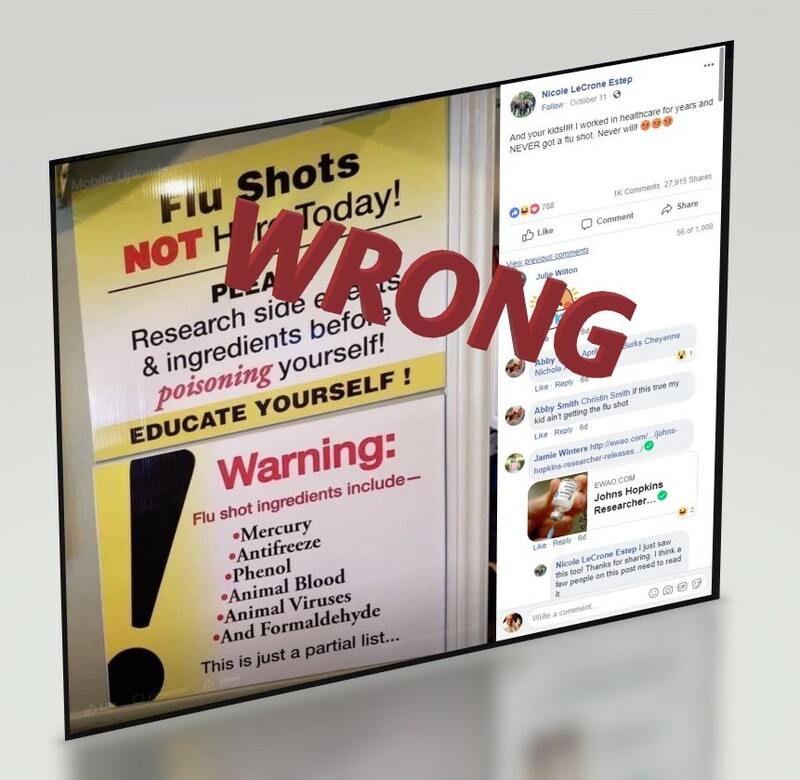 In a Facebook post, Nicole LeCrone Estep, who claims to have "worked in healthcare for years," offers a photograph of a sign about flu shots that asks people to "Research side effects & ingredients before poisoning yourself!" The word "poisoning" is in bright red letters. The post states that the flu shot includes ingredients such as mercury, antifreeze, phenol, animal blood, animal viruses and formaldehyde. The meme offers no evidence and cites no source. She did not respond to a Facebook message. Medical experts say the evidence is overwhelming that flu shots are safe and effective, although they routinely acknowledge that the shots are far from completely protective. The degree of protection depends, in part, on how well the experts predict which strains of influenza will be making the rounds during the coming flu season. Last year, for example, the Centers for Disease Control and Prevention found that the shots were only 40% effective (57% for ages 6 months to 8 years and adults 50 to 64). Of the 183 children killed during the flu last season, about 80% were not vaccinated. So what about the "poisons" cited in the Facebook post? "Almost everything in there is false," said Dr. Neal A. Halsey, after reading the post. Halsey is director emeritus of the Institute for Vaccine Safety at Johns Hopkins University's Bloomberg School of Public Health in Baltimore. MERCURY - This is a reference to thimerosal, a preservative that inactivates any contaminants that might have escaped the production process. Thimerosal contains ethyl mercury, which decomposes rapidly, quickly passes through the body and is widely considered safe, unlike its poisonous cousin, methyl mercury, which is found in certain kinds of fish. Most flu vaccines no longer contain thimerosal and the ones that do -- packaged for multiple doses -- contain an amount too minuscule to cause harm. Vaccine opponents say thimerosal contains poisonous mercury and may cause autism. There is no evidence that the thimerosal in vaccines is harmful and numerous studies have disproven the claim that it causes autism. ANTIFREEZE - The meme isn't specific here. After all, common table salt is an antifreeze, lowering the freezing point of water. In addition, various creatures use natural antifreeze chemicals such as glycerol or dimethyl sulfoxide to survive freezing temperatures. Automotive antifreeze products contain ethylene glycol or propylene glycol. Neither are found in flu vaccines. "No influenza vaccine contains an antifreeze," said Dr. Halsey. ANIMAL VIRUSES - They have not been found in any flu vaccine. FORMALDEHYDE - This is present in tiny amounts of some flu vaccines. It has been used for years in vaccine development, often to kill live virus particles so they can be used in the vaccine to safely immunize a recipient. According to the Centers for Disease Control and Prevention, formaldehyde is also used "to kill unwanted viruses and bacteria that might contaminate the vaccine during production." If it is used, most is removed before the vaccine is packaged, the CDC reports. The human body, in fact, makes its own formaldehyde and is continuously processing the chemical. A healthy newborn weighing 6 to 8 pounds has 50 to 70 times more formaldehyde in their body than what they would get from all their vaccines, according to the Food and Drug Administration. In short, the claim that you are poisoning yourself when you get the flu vaccine is false. The fact that the vaccine could save you days of misery; prevent you from spreading the virus to family, friends and coworkers; and might even save your life or, indirectly, the lives of others, makes the claim irresponsible. Published: Thursday, October 25th, 2018 at 9:46 a.m.